The economic justice issues facing organic farmers and workers in the northeastern United States are consistent with many of the challenges faced in conventional agriculture such as inadequate pay, lack of housing, intense market competition, and health-related problems due to the strenuous nature of the work. The reasons for these issues, however, may differ in the organic farming sector. In small-scale organic farming the issues largely come from a lack of systemic infrastructure within which the farmers themselves can make enough income to support and enact their values of justice and sustainability. 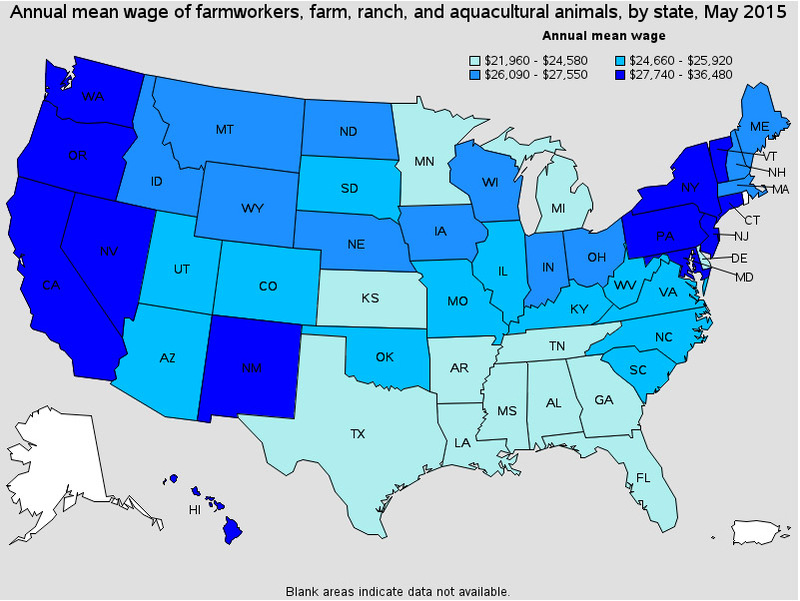 Thus small-scale organic agriculture and its farmers and laborers can be considered a population marginalized within the larger political-economic landscape of U.S. agriculture. Who are these farmers and workers on small-scale organic farms in the northeastern U.S.? Publicly available reports offer a useful snapshot of organic agriculture nationally, including who works on different types of farms and farm types predominant in different regions of the country. They offer little decisive information, however, that tells the story of farmers and laborers on organic farms in the northeastern United States. What follows are some of the results of a survey of NOFA farmer members meant to illuminate the answer to this question. The survey included 36 items asking questions about the market for organic products, including where farmers sell their products and issues they encounter (if any) with their major buyers, pay for workers, housing, attitudes toward policies such as unemployment insurance thresholds, membership in organizations like NOFA, and benefits farmers derive from those memberships. In addition, the survey asked about farmers’ values and practices related to farming organically, such as whether they do so because it is a family tradition, and whether they uphold ideals about the environment. 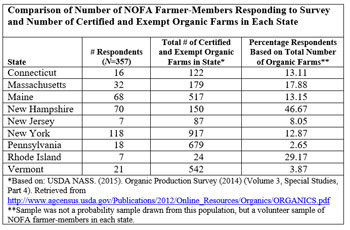 While for this survey it would be desirable to generalize the results to all the farmer-members of NOFA and/or organic farmers in the Northeast, it is important to note that the results collected are only representative of those farmers who completed the survey. The survey was administered using an online survey tool, and it opened for responses on January 2, 2013, and closed on March 15, 2013. An invitation to participate was sent electronically on multiple occasions to all members using a variety of email lists that reach NOFA farmer members. In addition, recruitment materials were distributed in print at state chapters’ annual meetings. Participants had the option of filling out the survey via paper and mailing it back in a postage-provided envelope. There were 357 usable survey responses from NOFA farmer members. Per information collected by NOFA’s Interstate Council, there are about 5,000 members of NOFA across their network, approximately one-quarter of whom are farmers. Based on these estimates, then, the total number of the population from which this volunteer sample was drawn is around 1,250 farmer members, indicating roughly a 28.6% response rate overall. Because of the nature of this survey and its focus on labor characteristics, constraints, and opportunities, as well as farmer values and involvement in NOFA and other organizations, no information on farm size or the predominant products on each farm was gathered. In hindsight, this is a limitation of the study because the size of the farm and the products grown, raised, and harvested affect the labor needed on the farm, as well as the conditions in which workers find themselves. As you’ll see in the data presented, according to the survey most farms in the NOFA network are small-scale farms using organic practices, a population about whose labor practices little specific research has been done. Findings also indicate that these farms rely heavily on labor from family and community members in order to operate. While this study is by no means a comprehensive examination of all organic farms in the Northeast, it provides insight into the labor force and related justice issues faced by small-scale organic farmers and farmworkers. Further researching the experiences of these farmers and laborers is essential for informing future policy and practice not only within NOFA, but also across the Northeast and nationwide. In addition, expanding the geographic scale in a future study in order to include small-scale organic farming across the U.S. would be helpful to compare across regions what is working well to advance justice for organic farmers and their laborers. Doing so could expand and strengthen the network through which organic farmers can connect with and learn from one another toward the development of not only more environmentally sustainable farms, but also economically sustainable businesses that are able to fulfill their values for justice for their owners and employees. All 357 respondents included in this analysis answered the series of questions asking them to indicate what type of labor they use on their farms. As shown, the overwhelming response was ‘family members’, which is not surprising given that the Northeast is known for its small scale, family farming. Figure 1 reports the number of farms that indicated using that type of labor. Note that the categories are not mutually exclusive, meaning a farmer could check more than one referring to the same worker (i.e. ‘Paid employees’ could also be ‘Family members’, etc.) For those who answered ‘other’, responses included spouses, developmentally disabled adults, youth needing community service hours, court mandated community service, and ‘wwoofers’ (people involved in the World Wide Opportunities on Organic Farms network), among others. For all workers, respondents were asked “Please tell us how many people worked on your farm and were [paid] [not paid] for each category in the 2012 calendar year. ‘Year Round’ is anyone who is a 12-month employee of your farm and ‘Seasonal’ applies to anyone working less than that. 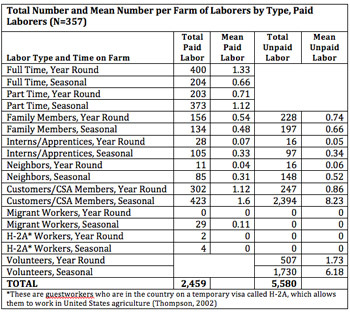 If no one in that category worked on your farm in 2012, please enter 0.” Table 1 indicates the total number of types of workers reported by respondents as well as the mean number of workers of each type. As this table demonstrates, many farmers depend largely on unpaid workers, namely in the form of seasonal volunteers and customers/CSA members. The survey did not ask how many hours per week or season each type of laborer contributed; therefore, comparisons between worker types are difficult. Another important concern with respect to labor is retention. Thus, respondents were asked, “What percentage of your workers in 2012 were in their first year working on your farm?” A higher percentage of workers on the farm in their first year would indicate lower retention from the previous year or that the farm was new. Figure 2 summarizes the results of the 287 responses to this question. 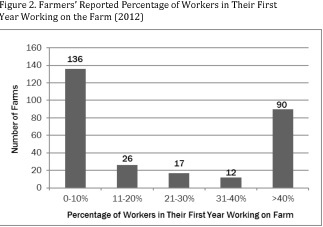 At nearly half (49%) of the farms, only 0-10% of workers were in their first year working at that location, but 32% of the farms reported that greater than 40% of their workers were in their first year on the farm. Payroll ranges and benefits to workers. Two open ended questions asked respondents to report the amount paid per hour to their lowest and highest paid hourly worker. Some 124 respondents filled out the question asking about the lowest paid hourly worker, and 118 answered regarding their highest paid hourly worker. Several respondents declined to answer this item and instead wrote things such as, “they work for nothing because they are part of the family.” These answers were not included in the analysis for this item. The below Wage Table provides the range paid for hourly workers as well as the state minimum wage (NH gives the federal minimum) and living wage for each of the states in the network as a point of reference. Benefits-eligible workers are defined by the federal government as employees who have “worked for a covered employer for at least 12 months, have 1,250 hours of service in the previous 12 months, and if at least 50 employees are employed by the employer within 75 miles”. Some 232 respondents reported the number of benefits-eligible workers they had during the year 2012, with 160 farmers reporting 0 benefits-eligible workers, and 72 reporting having 1 or more benefits-eligible workers. The survey itself did not provide this definition, so participants were left to determine ‘benefits-eligible’ on their own. 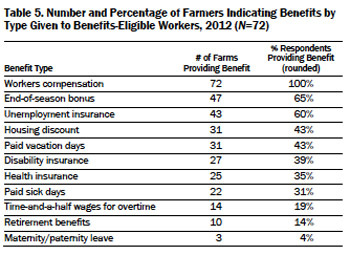 Many respondents had no benefits-eligible workers on their farms in 2012. The number of responses for each of the benefit types listed is represented in the Benefits Table on page A-3. The most prevalent type of benefit provided to benefits-eligible workers by respondent farms is workers compensation insurance, while the least prevalent are maternity/paternity leave, retirement benefits, and time and a half for overtime. Note that not all of the benefits listed are mandated by the government for eligible employees; the only mandatory benefits are worker compensation and leave through the Family Medical Leave Act (FMLA) in all of the states where NOFA farms are located. This accounts for the 100% compliance with workers compensation insurance provision. As you’ve seen in the data presented, according to the survey most farms in the NOFA network are small-scale farms using organic practices, a population about whose labor practices little specific research has been done. Findings also indicate that these farms rely heavily on labor from family and community members in order to operate. While this study is by no means a comprehensive examination of all organic farms in the Northeast, it provides insight into the labor force and related justice issues faced by small-scale organic farmers and farmworkers. Further researching the experiences of these farmers and laborers is essential for informing future policy and practice, not only within NOFA, but also across the Northeast and nationwide. In addition, expanding the geographic scale in a future study in order to include small-scale organic farming across the U.S. would be helpful to compare across regions what is working well to advance justice for organic farmers and their laborers. Doing so could expand and strengthen the network through which organic farmers can connect with and learn from one another toward the development of not only more environmentally sustainable farms, but also economically sustainable businesses that are able to fulfill their values for justice for their owners and employees.